The aim was to create a vibrant platform which would in return provide a strong show presence and create brand recognition for Guardiar. 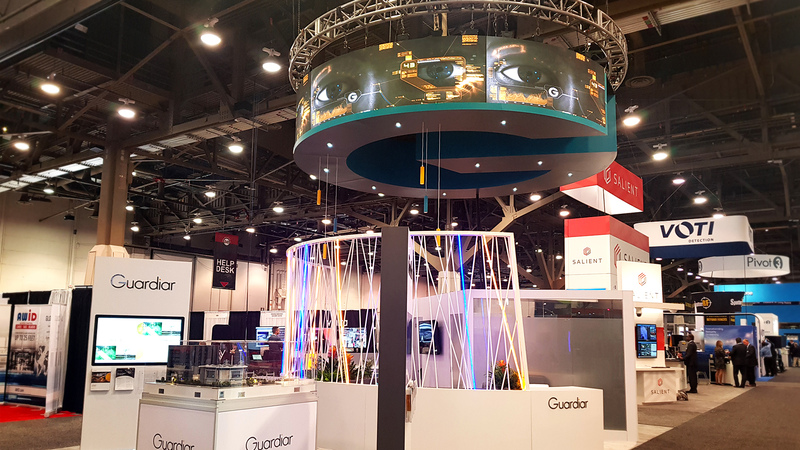 The project really got the design team thinking about how we could break boundaries and challenge the norm at GSX to create an all important strong show presence. Stand features needed to captivate show visitors whilst still allowing for exclusivity. After a series of strategic concept meetings the design team came up with something completely encapsulating. The result was a rarely seen LED 360° banner screen, also shaped to a ‘G’ to resonate with the brand. As you can see by just looking at the stand this was such a striking feature that engaged from all angles. Another requirement was the fact that the stand needed to be open yet private, which is where careful planning came into action. Resulting in a G shaped meeting area with geometric panels- creating a truly stylish barrier and exclusive feel. Exhibitors, passers-by and competitors were enthralled by the space and the feedback was a complete reinforcement of the design success.